» University Partnerships | Success for Every Student! The Goalbook University Partnership Program enables accredited teacher education programs to provide Goalbook Toolkit at reduced cost to student-teachers. The purpose of this program is to augment the work of teacher education programs in preparing the next generation of educators by increasing their knowledge and confidence in leveraging the latest educational technology to ensure the success of all students. Two professors at San Francisco State University examined IEP goals written by their graduate students, and discovered that they were missing many key elements. They then partnered with Goalbook and provided the resource for their students. 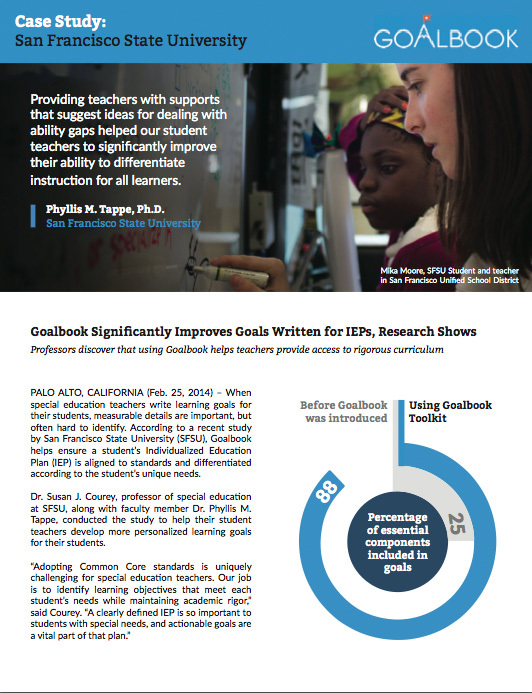 Goalbook Toolkit resulted in a significant improvement in crafting IEPs that were personalized, aligned with Common Core State Standards, and more useful in monitoring student progress.